During the 2015 Steam holiday sale I purchased Stranded Deep. I’ve been thinking about picking it up for some time because I enjoy survival games although most never see their full potential. I made the mistake of buying it along with Subnautica which made me unconsciously compare the two even though they are very different survival type games. So I stepped away from Stranded Deep and came back to it after a few week to give it a fresh look. First off obviously the game is still in early access so there are issues and I can understand that. Thing’s like the hammers doing nothing, not being able to cut down trees, several items not having inventory images, these things are excusable. 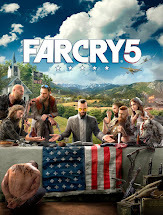 I think the game in its current state portrays what the game design is trying to do and the game play shows the extent of what they plan to create. What I would like to do is look at the game from a design perspective and offer some opinions. Currently when the game starts you are in a life raft floating near the island you chose in the world creation screen. In play through videos I have seen there was a plane crash scenario that let you be in this predicament. Obviously I don’t know what the developer’s plans are but without it and maybe even with it I think starting in the raft is a bad choice. First time players could be disoriented because you do see many distant islands you could paddle toward. 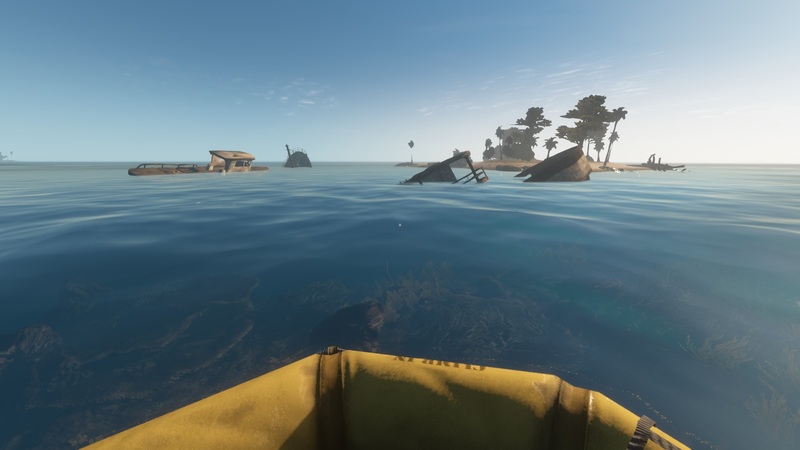 Also the raft physics and controls are not great and I seemed to have a natural tendency to press “W” while paddling because I want to go forward which would make me walk off the raft and into the ocean. Even after knowing you don't need to press forward I still found myself doing it many times. Getting back into the raft is clumsy and it takes some time to realize you can only climb up the side with the small ladder. Eventually you make it to the shore and struggle with another odd feeling that you want to drag the raft out of the water which you really can’t do. So you leave it feeling that it might drift away. Personally I feel waking up on the beach would be a much better solution. It avoids all the weirdness of the raft, puts you on the correct island, and you would instantly feel that you washed ashore after an incident. My assumption is that the developer didn’t go this route because placing a player spawn in a randomly generated shoreline could be challenging, much easier to plop them in the ocean and let the player figure it out. Graphically the game looks great. I’m really amazed it’s the Unity engine. There are really beautiful skies and sunsets and the ocean looks really amazing. 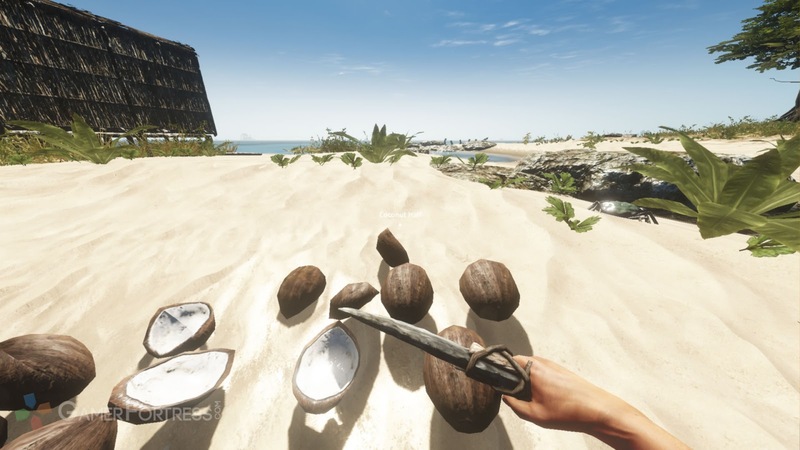 The game objects suffer from some harsh LOD popping which affects game play poorly. 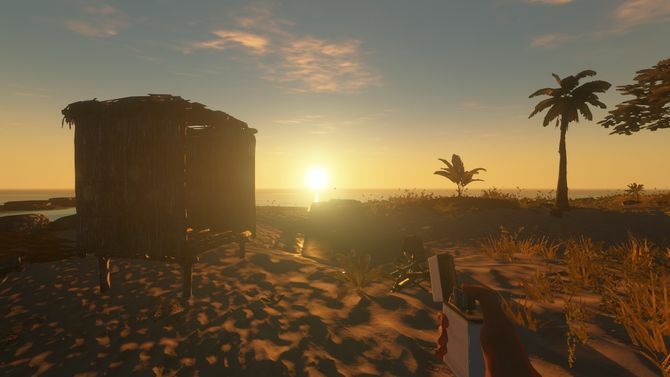 Since you are searching the beaches for useful items you can’t really see anything from a distance so you have to walk every beach and see if anything “pops” into existence when you get closer. The water tech is pretty good. 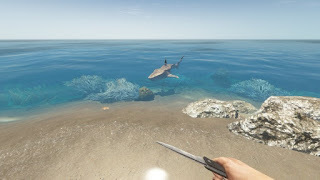 Unlike Subnautica the designers of Stranded Deep realized that the ocean is a character in the game. It is both the friend and the enemy of the player and should show moods. So on sunny days the water is clear and colorful. On rainy days it is dark and menacing. Unfortunately there isn’t a lot of wave action. As a player I was afraid of setting up my settlement on an island with low elevation for fear of the ocean waves sweeping over it during a thunderstorm. But so far in my hours of playing there haven’t been any thunderstorms or scary high waves which has been disappointing to a degree. Game play itself is pretty basic. Survival expert Les Stroud is quoted in saying that the easiest environment to be stranded is a tropical island as long as you have fresh water, and I would so far agree. Stranded Deep is fairly easy. You have a wrist watch that tells your health, hunger, and thirst. Most all of this can be controlled with coconuts and frankly that is where the game falls short. You drink the coconut milk then cut the coconut in half and eat it which fills both needs with one item. So in regards to surviving you just won the game. Really all you need to do then is paddle around gathering coconuts. However in what I consider a strange decision the designers made your hunger drop much faster than your thirst. A really odd choice since everyone knows you can survive much longer without food than you can without water. This often leaves you in a weird spot where you don’t want to waste the water in the coconuts so you drink it before eating even if you don’t need it. Which means you are always super hydrated, not what I would have expected on deserted islands with no running fresh water. I thought water would be the struggle. There are of course other food items you can gather such as crabs and potatoes. Potatoes for some reason make you throw up if you eat them raw. I don’t really understand why since you can totally eat raw potatoes in reality. This is a bigger issues when raw and cooked items remain stacked together in your inventory which I can only assume is a bug. So you cook an item and if you don’t cook the entire stack you never know if what you’re eating is cooked or raw, but you figure out which you grabbed when you throw up after. I would assume there are fish you can eat although I have yet to do so. Other than gathering food items you can gather building materials. 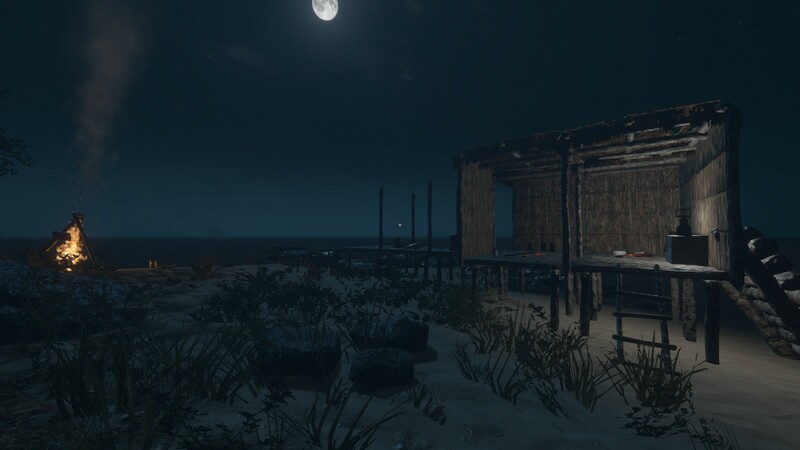 From things such as driftwood, shipping containers, salvaged metals, you can create buildings and shelters. This is a neat thing to keep you busy but I’m really not sure there is a point to doing it. Standing in the shelters seems to create no benefits at all. Granted I became sunburn once from sun exposure but does that mean I should be standing in my shelter during the day, and what does that game play look like? Reminds me of the game The Long Dark when you have a fire going, nothing to craft, and a frigid blizzard blowing outside, nothing to do but stand there. Waiting is not game play. You can even create structures with multiple rooms and multiple floors. Still I’m so far lost why you want to do this in a game where you are alone and nothing is attacking you on land. I get that it’s just fun and I’m fine with that, it would just be great if it was tied into game play somehow. Perhaps keeping things dry could keep food from rotting or keeping yourself inside during a the rain can keep your health from dropping. The only enemies I have encountered have been the sharks, tiger sharks and great white sharks. 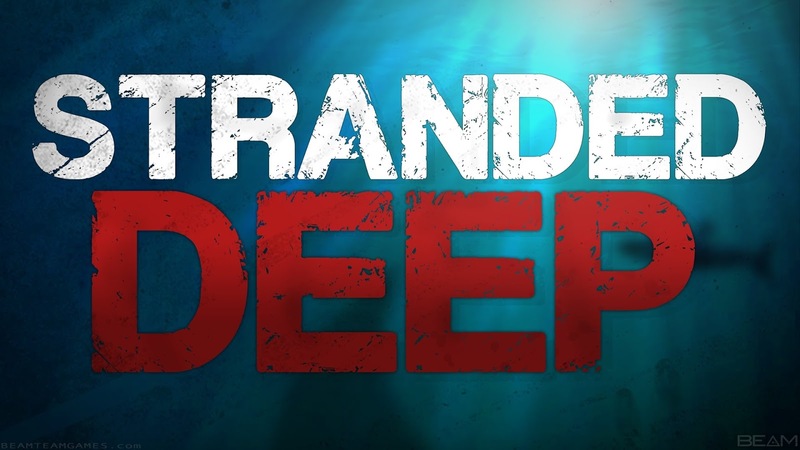 In real life deep ocean and sharks freak me the hell out so this game has the ability to push my panic buttons. However the game plays a little warning musical event when they appear so you scramble even if you don’t see them. In murky water I can’t handle it. Just the idea that they could be there make me to leave all water explorations for sunny days and clear water. So far I have not been killed or even attacked by anything in the game. I get the hell out of the water as soon as I see one. I have however died several times, but not to the sharks. All times it has been from falling while climbing for coconuts. Climbing the trees is really clunky. You never really know when or why you are going to fall. Sometimes you don’t and sometimes you drop from what seems like no reason at all. Often the game feels confused as to which direction the inputs mean. Generally pressing forward would make you climb and pressing backwards should make you descend but this doesn’t always work. I’ve had several occasions when pressing back makes me continue going up so you start using a little lateral movement to get the right results which can often make you fall. Hitting the ground sometimes does nothing, sometimes you break a limb, and sometimes you die outright. Breaking a limb causes your health to start dropping to zero and you have to eat and drink much more. Also your wrist watch view becomes terribly skewed and you can hardly get into a position to view it at all. I would assume crafting bandages would help but that requires cloth when I have only found once. My health dropped to zero and then nothing. My watch kept beeping at me but there was nothing I could really do about it. I didn’t die and eventually got sick of it and started over. I think the game has great potential and I hope it will reach for it. It's possible I have not played enough to get the full scope of the game but Steam says I've played 9 hours which is enough time for me to have some solid opinions. I think the food/water system needs an overhaul. Coconut should only keep you barely alive forcing you to seek out fish and other food sources with more drive. Islands with a more stable environment involving small mountains and fresh water streams to seek would be great. 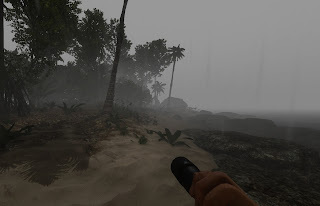 Tropical storms with high waves and lightning would really shake up the easy lull of the current difficulty and cause the players to create high building structures to escape the rising water. The introduction of daily tide cycles and ocean currents could also add to the difficulty. I think they have a good game on their hands that could be an excellent game if the continued development has the funds to do so. Note: I did not create the screenshots. They were gathered from Google.